The new benchmark has been set for superbases. The previous record holder was LiO–, with a computed proton affinity of 424.9 kcal mol-1. 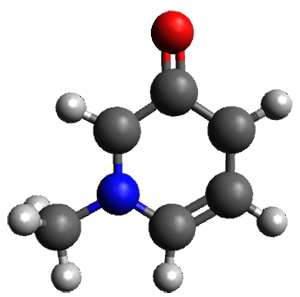 A new study by Poad, et al., examines the dianions of the three isomeric phenyldiacetylides: 1o, 1m, and 1p.1 Their computed proton affinities (G4(MP2)-6X) are 440.6, 427.0, and 425.6 kcal mol-1, respectively. The optimized geometries of these dianions are shown in Figure 1. Figure 1. Optimized geometries of 1o, 1m, and 1p. The authors also prepared these bases inside a mass spectrometer. All three deprotonate water, but do not deprotonate methane, though that might be a kinetic issue. The authors speculate that 1o will be hard to beat as a base since loss of an electron is always a concern with small dianions. 1) Poad, B. L. J.; Reed, N. D.; Hansen, C. S.; Trevitt, A. J.; Blanksby, S. J.; Mackay, E. G.; Sherburn, M. S.; Chan, B.; Radom, L., "Preparation of an ion with the highest calculated proton affinity: ortho-diethynylbenzene dianion." Chem. Sci. 2016, 7, 6245-6250, DOI: 10.1039/C6SC01726F. Kass and coworkers looked at a series of substituted phenols to tease out ways to produce stronger acids in non-polar media.1 First they established a linear relationship between the vibrational frequency shifts of the hydroxyl group in going from CCl4 as solvent to CCl4 doped with 1% acetonitrile with the experimental pKa in DMSO. They also showed a strong relationship between this vibrational frequency shift and gas phase acidity (both experimental and computed deprotonation energies). A key recognition was that a charged substituent (like say ammonium) has a much larger effect on the gas-phase (and non-polar solvent) acidity than on the acidity in a polar solvent, like DMSO. This can be attributed to the lack of a medium able to stable charge build-up in non-polar solvent or in the gas phase. This led them to 1, for which B3LYP/6-31+G(d,p) computations of the analogous dipentyl derivative 2 (see Figure 1) indicated a deprotonation free energy of 261.4 kcal mol-1, nearly 60 kcal mol-1 smaller than any other substituted phenol they previously examined. Subsequent measurement of the OH vibrational frequency shift showed the largest shift, indicating that 1 is extremely acidic in non-polar solvent. Further computational exploration led to 3 (see Figure 1), for which computations predicted an even smaller deprotonation energy of 231.1 kcal mol-1. Preparation of 4 and experimental observation of its vibrational frequency shift revealed an even larger shift than for 1, making 4 extraordinarily acidic. Figure 1. B3LYP/6-31+G(d,p) optimized geometries of 2 and 3 and their conjugate bases. (1) Samet, M.; Buhle, J.; Zhou, Y.; Kass, S. R. "Charge-Enhanced Acidity and Catalyst Activation," J. Am. Chem. Soc. 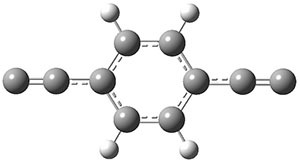 2015, 137, 4678-4680, DOI: 10.1021/jacs.5b01805. Organocatalysis affected by proline is an extremely active research area, and computational chemists have made considerable contributions (see Chapter 5.3 of my book – and this is expanded on in the 2nd edition which should be out in just a few months). 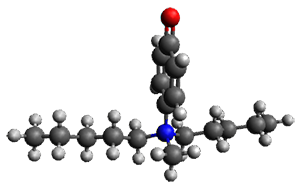 Most importantly, the Houk-List model1 for the catalysis was largely developed on the basis of computations. Recent experiments have indicated cocatalysts that can hydrogen bond to proline may increase the catalytic effect, including the enantioselectivity. 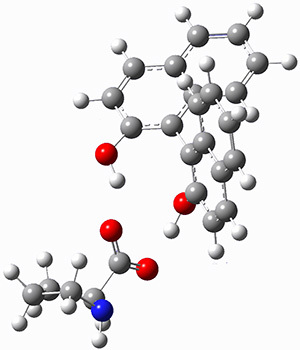 Xue and co-workers have examined a series of potential cocatalysts for their ability to enhance the acidity of proline.2 This is important in that a proton transfer is a component to the key step of the Houk-List model. 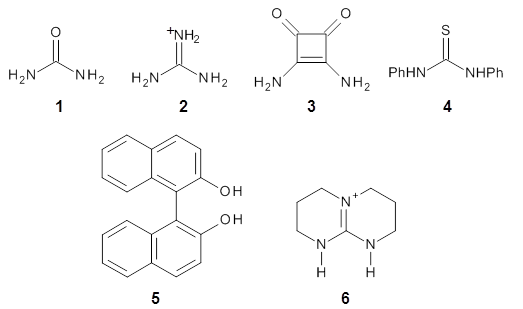 The cocatalysts examined included such compounds as 1–6. 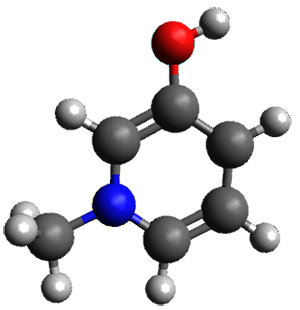 The deprotonation energy of proline with the associated cocatalysts was compared with that of proline itself. The energies were computed at M06-2x/6-311++G(2df,2p)//B3LYP/6-31+G(d) with the SMD treatment of five solvents. The structure of 5 with proline is shown in Figure 1. Figure 1. 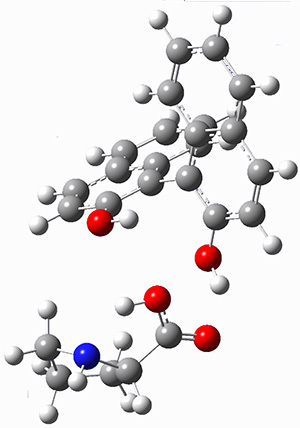 M06-2x/6-311++G(2df,2p)//B3LYP/6-31+G(d) optimized structure of 5 with proline and its conjugate base. The effect of the cocatalysts is striking. In the gas phase, these additives decrease the pKa of proline by 15 – 70 pKa units, with 2 showing the largest effect. In solvent, the effect of the cocatalyst is attenuated, especially in more polar solvents, but still a considerable decrease in the pKa is seen (as much as a 12 pKa unit increase in acidity). Further exploration of potential cocatalysts seems fully warranted. (1) Allemann, C.; Gordillo, R.; Clemente, F. R.; Cheong, P. H.-Y. ; Houk, K. N. "Theory of Asymmetric Organocatalysis of Aldol and Related Reactions: Rationalizations and Predictions," Acc. Chem. Res. 2004, 37, 558-569, DOI: 10.1021/ar0300524. (2) Xue, X.-S.; Yang, C.; Li, X.; Cheng, J.-P. "Computational Study on the pKa Shifts in Proline Induced by Hydrogen-Bond-Donating Cocatalysts," J. Org. Chem. 2014, 79, 1166–1173, DOI: 10.1021/jo402605n. Table 1 lists the computed and experimental free energies of deprotonation of 1. The experimental values are computed at M06-2x/maug-cc-pVT(+d)Z. The structure of 1cb is drawn in Figure 1. Table 1. 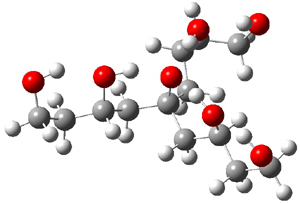 Computed and experimental free energies (kcal mol-1 of deprotonation of some alcohols. The difference in the acidity of t-butanol and 2, some 30 kcal mol-1, reflects the stability afforded by three intramolecular hydrogen bonds to the oxyanion. In going from 2cb to 1cb, each of the hydroxyl groups that donate to the oxyanion act as the acceptor of a hydrogen bond from the more removed hydroxyl groups. There is in effect a first and second layer of hydrogen bond network in 1cb. 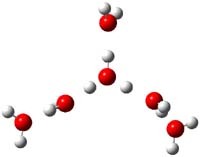 These secondary hydrogen bonds lead to further stabilization of the anion, as reflected in the diminished DPE of 1 over 2: 320.2 vs. 335.0 kcal mol-1. Note that this secondary layer does not stabilize the anion to the same degree as the primary layer, but nonetheless its effect is large and quite striking. Figure 1. M06-2x/maug-cc-pVT(+d)Z optimized structure of 1cb. Even in solution these more remote hydrogen bonds can stabilize the anion. So, using the CPCM approach and modeling DMSO, 2 is predicted have a pKa that is 15 units below that of t-butanol, and 1 is predicted to be 3 pKa units more acidic than 2. Experiments verify this prediction with the pKas of 16.1 for 2 and 11.4 for 1. The gas phase experimental acidity is accomplished by preparing the conjugate base of lithium acetylide through a procedure of collision-induced dissociation with loss of CO2, as in Scheme 1. By reacting this anion with a variety of different acids, they were able to bracket the acidity and determine that ΔHacid is 391.0 ± 1.3 kcal mol-1. This is about 13 kcal mol-1 less acidic than acetylene itself. The reduction is acidity understandable in terms of the C-Li being essentially ionic, and thereby loss of the proton builds up negative charge on a carbon adjacent to a carbon that already has a great deal of negative charge. (2) Streitwieser, A.; Bachrach, S. M.; Dorigo, A.; Schleyer, P. v. R. In Lithium Chemistry: A Theoretical and Experimental Overview; Sapse, A.-M., Schleyer, P. v. R., Eds. ; Wiley-Interscience: New York, 1995, p 1-45. The α-proton of ketones and aldehydes are acidic, thanks to delocalization of the resulting anion. However, α-protons at a bridgehead position are much less acidic – the resulting anion is not delocalized as the enolate would be an anti-Bredt alkene. So, what about more remote protons from the carbonyl – would they exhibit enhanced acidity due to inductive or field effects? Table 1. Relative energies (kcal mol-1) of the enolates of 1. Kass’ bracketing experiments indicate the enthalpy for deptrotonation of 2-adamantone is 394.7 ± 1.4 kcal mol-1. This is in nice accord with the computational results for loss of the βax proton: 393.8 (M06-2x/aug-cc-pVDZ) and 396.8 kcla mol-1 (G3). 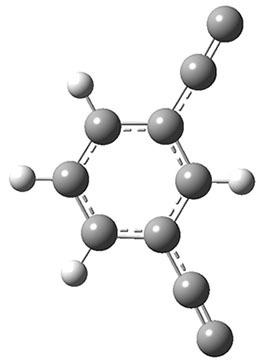 One interesting computational result is a competive cyclic structure 2, whose stability is similar to that to the βax ion at M06-2x and is the optimized structure produced at MP2/6-31G(d) when searching for the βeq enolate. analogues, but much less acidic than typical α-protons of ketones. 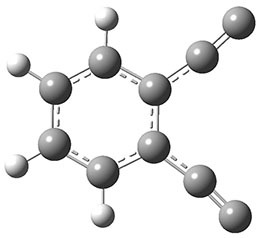 Predicting the pKa of a compound from first principles remains a challenge, despite all of the many algorithmic and methodological advantages within the sphere of computational chemistry. Predicting the gas-phase deprotonation energy is relatively straightforward as I detail in Section 2.2 of my book. The difficulty is in treating the solvent and the interaction of the acid and its conjugate base in solution. 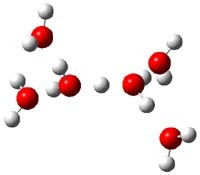 Considering that we are most interested in acidities in water, a very polar solvent, the interactions between water and the conjugate base and the proton are likely to be large and important! where c designates a class of compound, such as alcohol, carboxylic acid, amine, etc. Fitting constants αc and βc need to be found then for each unique class of compound, where the fitting is to experimental pKas in water. In their test suite, they employed eleven anilines and amines, seven pyridines, nine alcohols and phenols, and seven carboxylic acids. They test a number of different computational variants: (a) what functional to employ, (b) what basis set to use for optimizing structures, and (c) what basis set to use for the enthalpy computation. They opt to employ COSMO for treating the solvent and quickly reject the use of gas phase structures (and particularly use of geometries obtained with molecular mechanics. Their ultimate model is OLYP/6-311+G**//3-21G(d) with the COSMO solvation model. Mean deviation is less than 0.4 pK units. They do note that use of HF or PW91 provides similar small errors, but ultimately favor OLYP for its computational performance. While this procedure offers some guidance for future computation of acidity, I find a couple of issues. First, it relies on fitted parameters for every class of compound. If one is interested in a new class, then one must develop the appropriate parameters – and the experimental values may not be available or perhaps an insufficient number of them are experimentally available. Second, the parameters cover-up a great deal of problematic computational sins, like the solvation energy of the proton, small basis sets, missing correlation energies, missing dispersion corrections etc. A purist might hope for a computational algorithm that allows for systematic correction and improvement in the estimation of pKas. Further work needs to be done to meet this higher goal. Molecular structures can differ depending on phase, particularly between the gas and solution phase. Kass has looked at the protonation of 4-aminobenzoic acid. 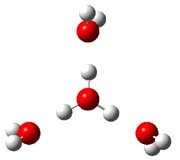 In water, the amino is its most basic site, but what is it in the gas phase? The computed relative energies of the protonation sites are listed in Table 1. If one corrects the B3LYP values for their errors in predicting the proton affinity of aniline and benzoic acid, the carbonyl oxygen is predicted to be the most basic site by 5.0 kcal mol-1, in nice accord with the G3 prediction of 4.1 kcal mol-1. Clearly, the structure depends on the medium. Table 1. Computed relative proton affinities (kcal mol-1) of 4-aminobenzoic acid. Electrospray of 4-aminobenzoic acid from 3:1 methanol/water and 1:1 acetonitrile/water solutions gave different CID spectra. H/D exchange confirmed that electrospray from the emthanol/water solution gave the oxygen protonated species while that from the acetonitrile/water solution gave the ammonium species. (1) Tian, Z.; Kass, S. R., “Gas-Phase versus Liquid-Phase Structures by Electrospray Ionization Mass Spectrometry,” Angew. Chem. Int. Ed., 2009, 48, 1321-1323, DOI: 10.1002/anie.200805392. Which is the Most Acidic Proton of Tyrosine? Following on their prediction that the thiol of cysteine1 is more acidic than the carboxylic acid group (see this post), Kass has examined the acidity of tyrosine 1.2 Which is more acidic: the hydroxyl (leading to the phenoxide 2) or the carboxyl (leading to the carboxylate 3) proton? 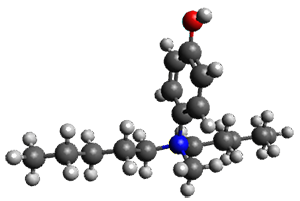 Kass optimized the structures of tyrosine and its two possible conjugate bases at B3LYP/aug-cc-pVDZ, shown in Figure 1, and also computed their energies at G3B3. 2 is predicted to be 0.2 kcal mol-1 lower in energy than 3 at B3LYP and slightly more stable at G3B3 (0.5 kcal mol-1). However, both computational methods underestimate the acidity of acetic acid more than that of phenol. When the deprotonation energies are corrected for this error, the phenolic proton is predicted to be 0.4 kcal mol-1 more acidic than the carboxylate proton at B3LYP and 0.9 kcal mol-1 more acidic at G3B3. Gas phase experiments indicate that deprotonation of tyrosine leads to a 70:30 mixture of the phenoxide to carboxylate anions. The computations are in nice agreement with this experiment. (A Boltzmann weighting of the computed lowest energy conformers makes only a small difference to the distribution relative to using simply the single lowest energy conformer.) This demonstrates once again the important role of solvent, since only the carboxylate anion is seen in aqueous solution. (1) Tian, Z.; Pawlow, A.; Poutsma, J. C.; Kass, S. R., "Are Carboxyl Groups the Most Acidic Sites in Amino Acids? Gas-Phase Acidity, H/D Exchange Experiments, and Computations on Cysteine and Its Conjugate Base," J. Am. Chem. Soc., 2007, 129, 5403-5407, DOI: 10.1021/ja0666194. (2) Tian, Z.; Wang, X.-B. ; Wang, L.-S.; Kass, S. R., "Are Carboxyl Groups the Most Acidic Sites in Amino Acids? Gas-Phase Acidities, Photoelectron Spectra, and Computations on Tyrosine, p-Hydroxybenzoic Acid, and Their Conjugate Bases," J. Am. Chem. Soc., 2009, 131, 1174-1181, DOI: 10.1021/ja807982k.